This speedy recipe is packed with the irresistible summer flavours of basil, olives and melting mozzarella cheese - the taste of Italy in a burger. Preheat the barbecue or grill. In a large bowl, mix the beef, onion, garlic and pesto with your hands, then knead in the olives, mozzarella and season. With wet hands, shape into 4 burgers, brush with a little oil and chill for 20 minutes. Cook for 6-8 minutes on each side until thoroughly cooked, the juices run clear and there is no pink meat. Cut 4 baked Waitrose Ready to Bake Italian Recipe Ciabatta Rolls in half and add some slices of tomato. 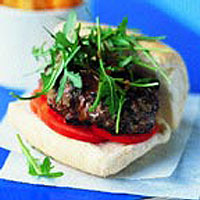 Top with a burger and some rocket, then drizzle a little Waitrose Sundried Tomato and Balsamic Vinegar Dressing over. Serve with Waitrose Straight Cut Oven Chips. These burgers can be frozen. Open-freeze the patties on a tray lined with greaseproof paper until firm, then pack into labelled containers or freezer bags and freeze for up to 1 month. Defrost thoroughly in the fridge before cooking.